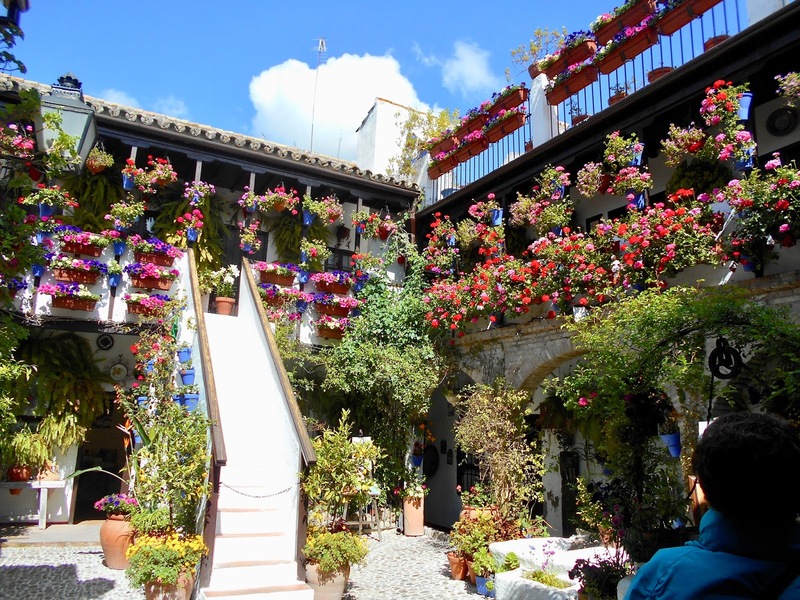 Cordoba's hot, dry climate allowed its early inhabitants - first the Romans and later Muslims - to build homes with a centre courtyard that often included a fountain and well to collect rainwater. 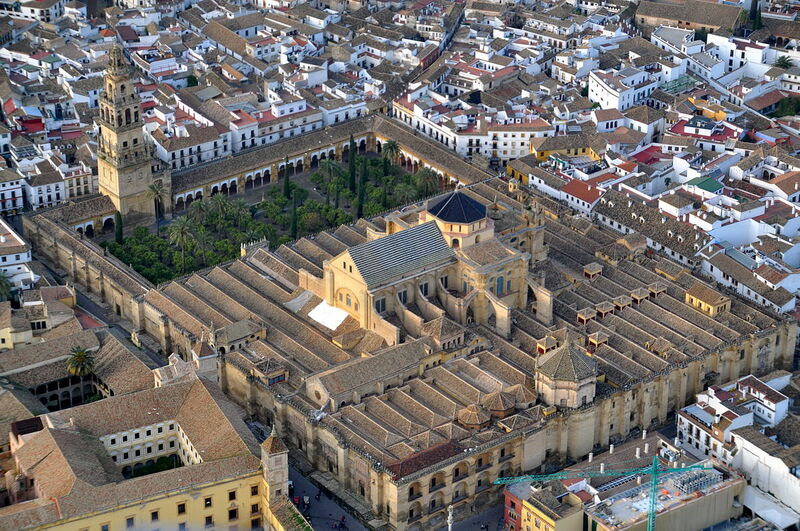 The Mezquita-Cathedral of Cordoba is an architectural, religious and historic wonder. 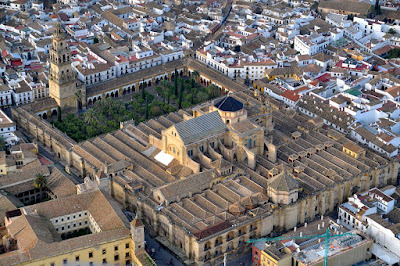 It has been used for thousands of years by peoples from various cultures and religious beliefs and today combines a unique Muslim/Christian blend that is visually stunning. On Monday, March 20, 2017 we arrived in Cordoba for a weeklong stay. 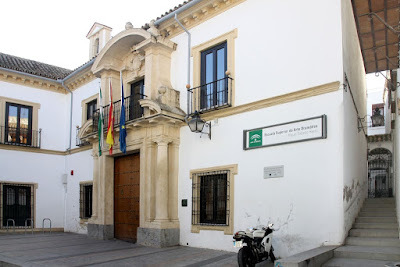 Within seven or eight minutes of hailing a cab from the train station we reached our destination on Calle (Street) Blanco Belmont, but neither the driver nor us could find the number of our Airbnb flat. 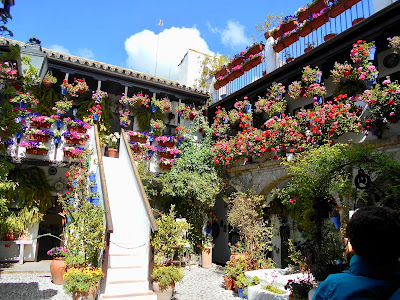 I made a quick phone call to our host, Juan, who came to meet us and once we saw the narrow staircase leading up to the flat (far right below) we no longer felt like complete tourists for not finding our way - especially as the cabbie had difficulty as well. 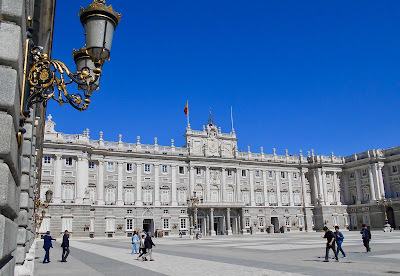 While we were in Madrid we toured the largest palace in Europe - the Royal Palace. It was an easy walk from our flat on Calle Major and the audio guide (viewed on a Samsung tablet) provided close up shots of each specific item and that additional technical perk really enhanced our visit. 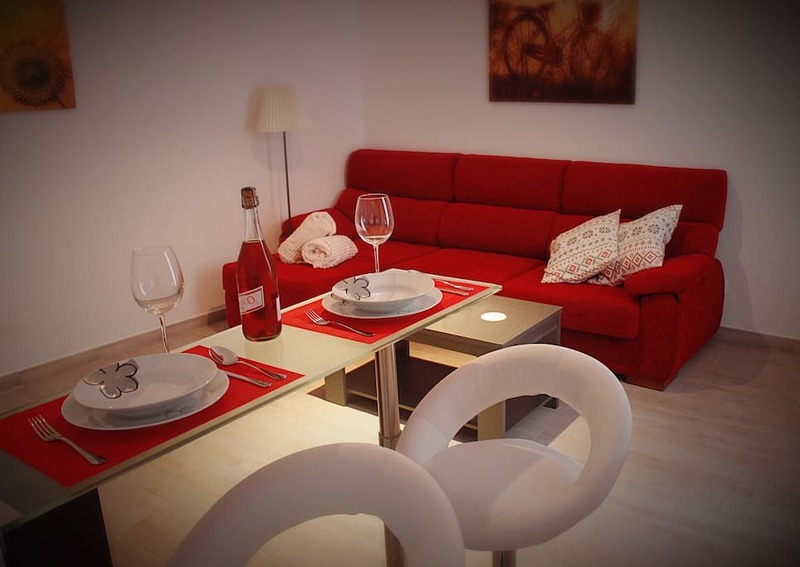 The week of March 13-19, 2017 we explored Madrid, beginning with our home base a lovely Airbnb flat completely renovated with all the mod cons. 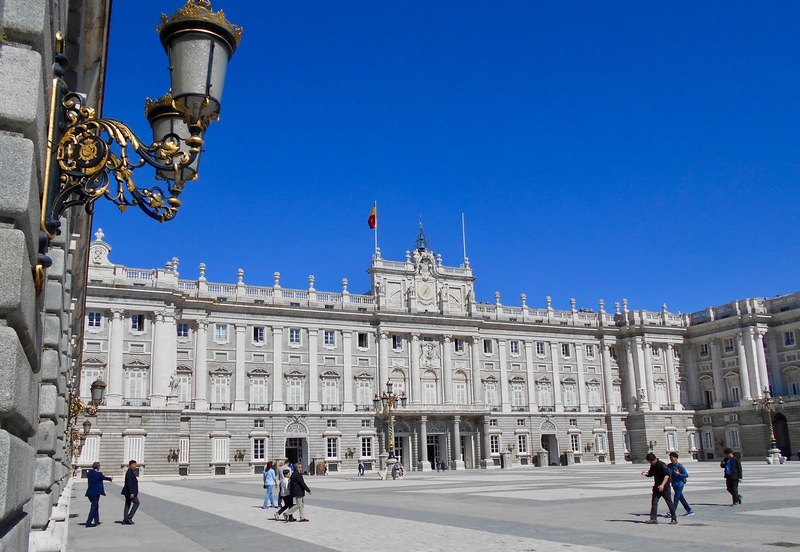 Although it was located downtown, on a main street and was literally steps away from the Plaza Mayor, there was not a sound once we stepped inside. Sheer bliss! 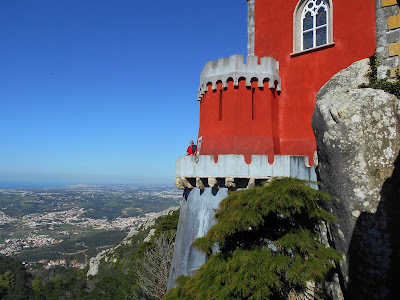 While we were in Lisbon we ventured outside of the city to tour Sintra's Pena Palace. 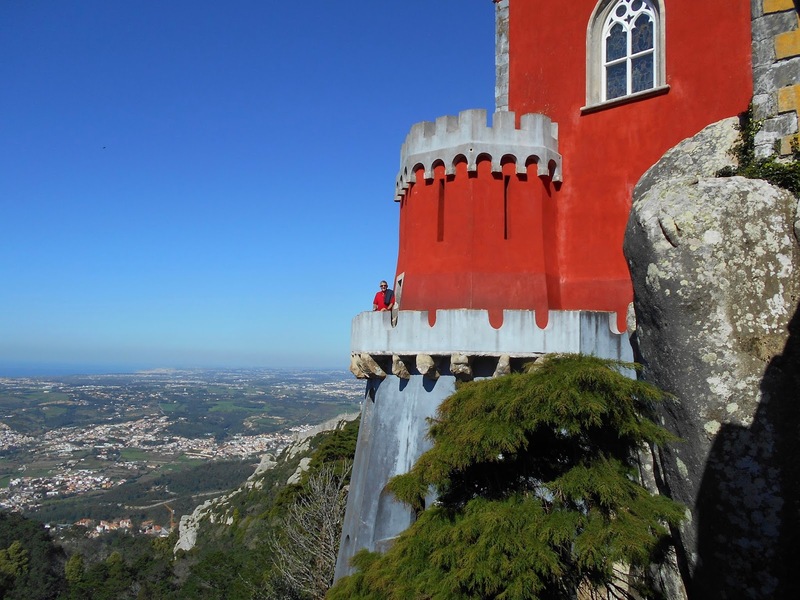 This fairyland palace with it's gorgeous exterior, spectacular mountain-top views and sumptuous interior is one of the most spectacular we've ever visited. No doubt you've seen those frazzled people at the airport huffing and puffing as they push a luggage cart piled high with suitcases - so many in fact they can barely see where they're going. Not only do they have to spend precious time lining up to check in all their earthly belongings, but they'll likely have to pay extra for the privilege. Once upon a time we were those frantic travellers. Now, we travel with carry-on luggage only. * Not only does it make travelling simpler, it saves money and reduces stress. John's bag on the left. Dianne's on the right.